Denis Levesque spends most of his time in the woods, but the forestry technician and avid hunter couldn’t believe the sight he and a friend happened upon Tuesday. Denis Levesque spends most of his time in the woods, but the forestry technician and avid hunter couldn't believe the sight he and a friend happened upon Tuesday. Levesque and Rene Legace spotted two bull moose duking it out in on a gravel road in the woods of northern New Brunswick. 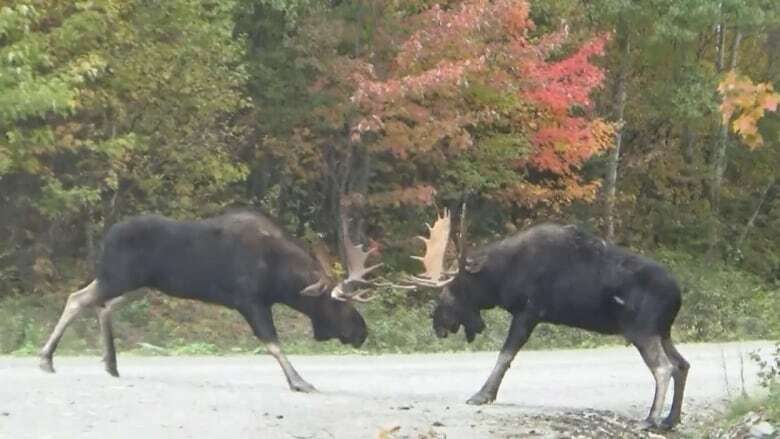 Levesque filmed the moose fighting for about 10 minutes before the duel broke off and the animals ran into the woods. "It was just incredible," said Levesque. "I had goosebumps on my back. I've never seen something like that, and I'm always in the woods." The resident of Val-d'Amour in Restigouche County estimated both sets of antlers measured at least 50 inches. He wasn't sure how much they weighed, but "they were pretty heavy." He figured the bulls were fighting over a cow. He uploaded the video to Facebook on Tuesday afternoon and it quickly went viral. As of Thursday evening, the video has been viewed more than 430,000 times. The popularity of the video has also attracted hundreds of hunters keen on exploring the area, Levesque said. But he won't divulge the location to protect the animals.